More than 65% of the population are visual learners. 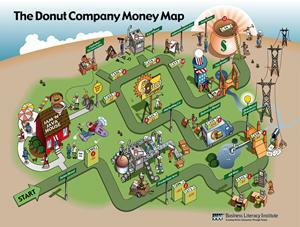 Money maps are great tools that present concepts in a visual way to help employees understand, and they are just plain fun. Our money maps illustrate the entire flow, process, or concept in one place, so everyone can see how it all fits together. It’s shocking how long our customers keep these maps on their walls. Call us today at (818) 591-5955 to see if money maps might work for you. 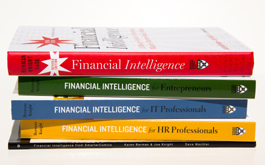 Financial concepts. The difference between cash and profit, the flow of the income statement, the money-making process, the sources and uses of cash, and the movement of investor dollars. Life cycles. Customer life cycle, a day in the life of an employee, and ongoing manager responsibilities. Business processes. The manufacturing process, service process, departmental process, product development, workflow, products and target customers, and pricing impact. Big picture. The organization’s strategy, departmental relationships, products and services, and competitive and sales issues. These are just a few examples; follow this link to see more custom money map examples. You can decide on the most important concepts, flows, or links in your business and we will create maps that illustrate these key processes. Call us today at (818) 591-5955 to talk about creating your own customized Money Map. 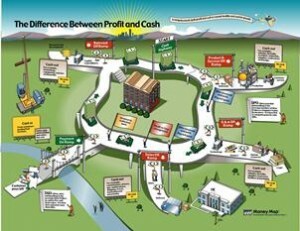 Customized money maps, create a visual that illustrates the specifics of your business, include illustrations that relate directly to your industry, and focuses on the exact concept, process or flow that you want. 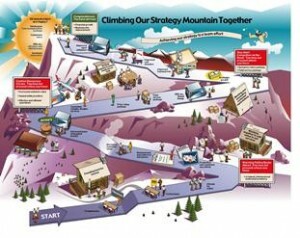 Your learners will see exactly how your organization looks at the concept or process illustrated. We also offer two standard money maps that are ready to ship to you. 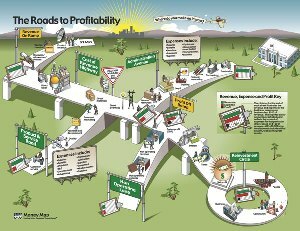 The Roads to Profitability map illustrates all the typical expenses that come out of revenue before profit is determined. Our research has shown that most people believe that a company retains 50% to 80% of revenues as profit. One glance at this map will show them the true picture. Your employees will immediately comprehend where the money comes from, where it goes, and how much is left over. One of the problems with running a successful business is that most expenses have to be paid before cash comes in from the sale. Cash may not be received from customers for 60 to 90 days after a sale has been made, but many cash outflows need to be immediate (try telling an employee that they’ll get their paycheck in 90 days). This is why cash is king – a concept that is well understood by those who pay the bills. But those who don’t see the cash inflows and outflows often don’t understand the difference between profit and cash. This map shows clearly how cash flows out weeks and months before any cash is received. Our money maps come in both an individual size (8 ½ X 11) as well as poster size (45” X 60” laminated). Orders for individual size money maps can be ordered here, call us at 818-591-5955 for poster size.